There’s a law against posting advertising on school property. But a recent sign planted on Bedford Middle School turf was not offering yard work, computer repairs or even a sports camp. It was put there by a private school, apparently to poach kids from public school. Not cool. And just wrong — on so many levels. This entry was posted in Children, Education and tagged Bedford Middle School, Fairfield Country Day School. Bookmark the permalink. 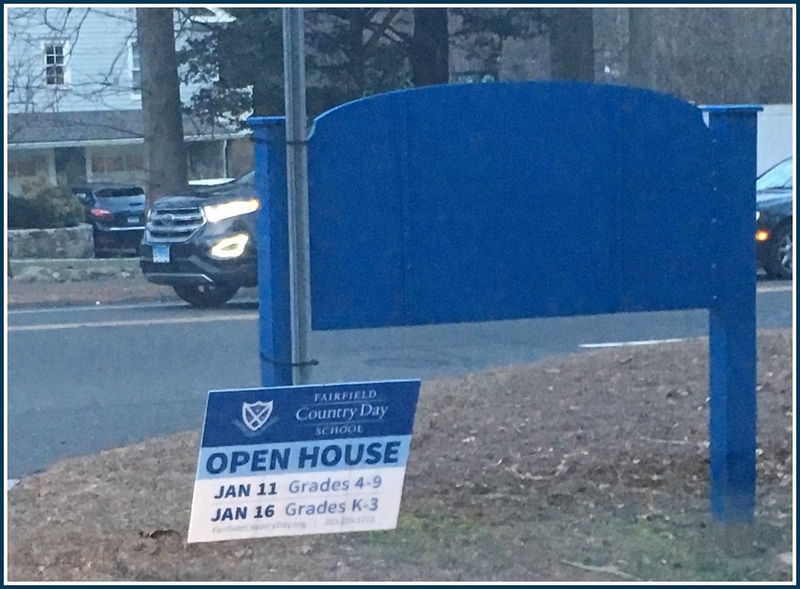 FCDS has had several open houses over the past few months. They might have lower enrollments than in the past. Also, they’re in the process of constructing a large building, which may be the reason for needing more students. The also don’t remove their signs after the Open Houses. Aside from it being wrong, the placement is in such poor taste – what a turn-off. litter, the property owner can press charges???? Isn’t the entire population of Coleytown Middle jammed into Bedford right now? Oh, except some of the 8th grade pods jammed into a wing of Staples with no end in sight. If you want something to be indignant about how about that? I think most people are capable of multiple, simultaneous indignations; one doesn’t necessarily discount the other.